The American political system has given young people plenty of cause for deleting its number from our phones, unfriending it on Facebook, and cutting it out of our lives completely in a fit of self-care. 1. Playing hard to get will get you nothing. ➽ If you don’t like how a company does business, boycotting its products can (sometimes) be an effective means of forcing change, because corporations need your money to survive. But if you don’t like how politicians govern, boycotting elections will change nothing because the government doesn’t need your ballot to stay afloat. When left-wing millennials sit out elections, they don’t force Democrats to pay more attention to their interests; they make it easier for the entire political system to ignore their wishes by ensuring that no one in power will be worried about losing their support. 2. The size of your voting bloc matters. ➽ There are few things the GOP isn’t willing to do to please its donor class, but cutting boomers’ beloved benefits is one. AARP members owe this immense clout not to the militancy of their street protests or the wit of their Twitter owns, but to their singular propensity for showing up at the polls. If we followed their example, we’d have the numbers to make student-debt relief, public day-care, and any of our generation’s other policy priorities into a source of bipartisan consensus. 3. Voting for the lesser of two evils is great — that way you get less evil. ➽ The Democratic Party is a deeply flawed institution, complicit in economic inequality in the U.S. and in unjust wars overseas. But if millennials had voted at the same rate as our parents in 2016, in all probability hundreds of thousands of longtime legal U.S. residents wouldn’t be in danger of losing the right to live here, thousands of child migrants wouldn’t have suffered the trauma of “family separation,” the Supreme Court wouldn’t have approved Republican efforts to disenfranchise nonwhite voters in Ohio and Texas or undermined reproductive rights in California, the Education Department would not be restricting access to federal-student-loan forgiveness while relaxing oversight of predatory for-profit colleges, the EPA would not be comporting itself as a lobbying arm of the fossil-fuel industry, the Treasury would not have forfeited hundreds of billions of dollars to America’s wealthiest taxpayers, and everyone the world over would have been able to continue ignoring the existence of the American president’s Twitter account. 4. You’re (probably) better informed about politics than the average American voter. 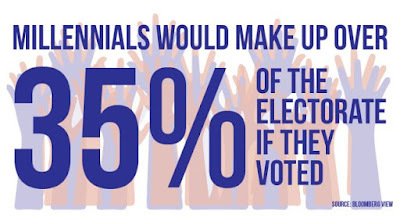 ➽ Many young people say they don’t “know enough about the issues” to vote. But we’re still far more in touch with reality than our elders. Millennials are more likely to accept that climate change is man-made, less likely to endorse prejudicial views of racial minorities and Islam, and far more liable to recognize Donald Trump’s unfitness for high office than any other generation of Americans. . . . . if more millennials voted, it would likely increase the salience of renters’ interests in U.S. politics. Similarly, the existing electorate is much less likely to comprehend the broader material challenges younger Americans face: Despite the U.S. doing far less for its young people (in subsidizing education, job training, housing, and child care) than just about any other advanced democracy, a majority of boomers say the government “does enough for young people” (but still needs to do more for older folks). 5. If voting changed anything, they’d make it illegal — and they are. ➽ In 2008, young voters helped deliver North Carolina to Barack Obama. Shortly thereafter, Republicans in the Tar Heel State’s government revised voter-ID law to exclude student-ID cards. Eight other states have adopted similar restrictions. Just this year, New Hampshire passed a law that effectively imposes a poll tax on college students who wish to vote in the state, Florida’s Republican governor (and Senate candidate) Rick Scott tried to block early voting on university campuses, and state legislators in North Dakota have disenfranchised just about everyone who lives on a Native American reservation. 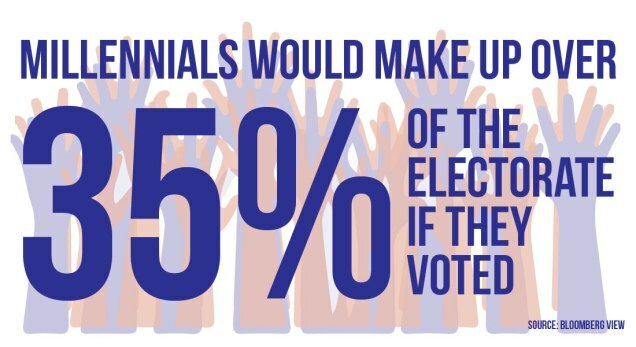 Millennials may doubt their ability to effect change at the ballot box, but the powers that be sure don’t. Please! Encourage all of your Millennials friends and family members to go to the polls and vote DEMOCRAT. I have done that. Let's hope everybody understands the importance of voting against the totalitarianism that the GOP has mistook for policy.